These are straight dough retarded overnight and shaped proved in the morning, coated with olive oil butter, parmeson, home grow chives and basil. These look deliciously simple. I have a formula for garlic bread sticks that people love but now I am thinking I will tie them up into knots like you have done. Love the crust color. All very appealing. Thanks for the inspiration! Do you use roasted garlic in the recipe? Is the garlic in the dough? These look scrumptious. No I did not put garlic in the dough since garlic interferes in yeast reactions. Garlic is in the butter and olive oil coating. Hi all fellow bakers, so I had an exciting day on Tuesday when i was guest at a local cooking show Food Diaries. 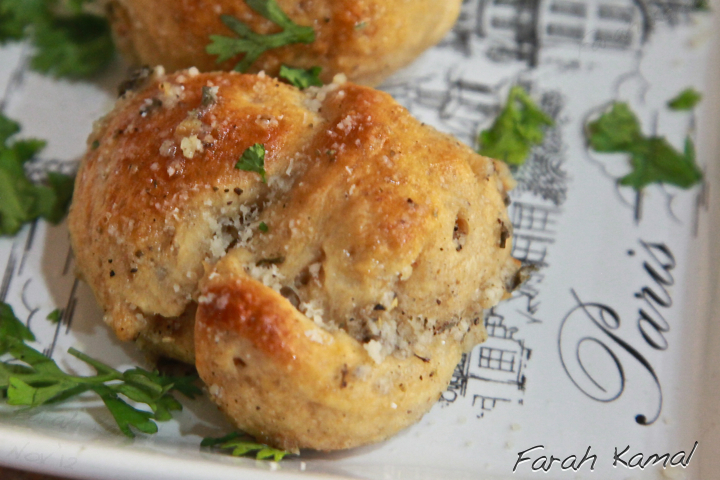 Hello Farah : I have been trying and trying to successfully make homemade garlic knots - I am an amateur baker and in my search came across your posting on Fresh Loaf and you garlic knots look amazing. Is there anyway you would kindly share your recipe with me . These are headed for the next picnic! Thank you, Farah. Got some lemon sage to toss into the herb mix or chop up into threads and put into the dough.